Are you looking for a change from a soup and sandwich lunch? Or perhaps you want to try some weekend recipes which are a little bit different but still low calorie. 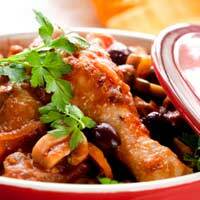 These recipes are all quickly prepared and easy to cook. They are satisfying meals, but light enough not to slow you down for the afternoon. At most they just need some crusty brown bread to accompany them. Fish makes for light, healthy eating and this lunch recipe is yet another quickly prepared, tasty lunch dish. It is a low 290 calories per serving. Heat the oil in a large pan, add onion, leeks and curry powder and saute for 3-4 minutes. Add courgettes and celery and cook for 2 minutes, stirring. Mix in the milk, crumble in the stock cube and add bay leaves, tomato puree and sweet corn. Season, bring to the boil, reduce heat and simmer, stirring, for 5 minutes. Blend the cornflour to a smooth paste with a little water. Off the heat, stir the cornflour into the mixture. Bring to the boil, stirring and simmer gently until thickened.Meanwhile, skin the fish and cut into large cubes. Add to the pan and simmer gently for 5 minutes or until cooked through. Stir in the sherry and parsley before serving with bread. If you are having guests over for lunch and want a low calorie recipe that is light and special, this creamy chicken dish is a good choice. It is a low calorie 285 per serving. Melt the butter in a flameproof casserole. Add chicken breasts two at a time, brown and remove with a slotted spoon. Stir shallots or onion into the remaining fat and saute for 1-2 minutes. Return the chicken to the pan with lager, brandy and mushrooms. Bring to the boil, cover and simmer for 20 minutes until the chicken is tender. Remove the chicken to a warm serving dish and cover with foil. Boil the cooking liquor until reduced by half. Stir in the cream and seasoning. Remove the foil and cover the chicken with the sauce. Garnish with parsley. This low calorie recipe uses light filo pastry and substantial vegetable and cheese fillings. These little tarts have around 380 calories per serving. Melt butter or margarine in a saucepan. Brush four 10cm tart tins with the butter. Layer the pastry squares in the tins, brushing between each layer, moving each pastry square round a quarter of a turn for each layer. Press well into the corners. Brush with remaining butter. Tarts should have a frilly edge. Bake in the oven at Gas mark 6 (200 degrees Celsius) for 8-10 minutes until golden. Cool slightly and remove from tins. Meanwhile heat the oil in a saucepan, add leeks, cover and cook over a gentle heat for 5 minutes until beginning to soften. Add mushrooms, stir and pour in the stock. Cover and cook gently for 5 minutes. Uncover, boil rapidly until liquid has almost evaporated. Stir in the tarragon and feta cheese. Season to taste and spoon mixture into the tartlets. Serve immediately. Experiment with your own low calorie recipes using different combinations of vegetables and cheese. Quick Spicy Fish is great. Oh my goodness, taste without the weight. Try it, it's worth it!